NASHVILLE, Tenn. — When CMT’s Katie Cook talked of friendship, dreams and hard work, the entire third floor of ACME Feed & Seed burst into cheers. 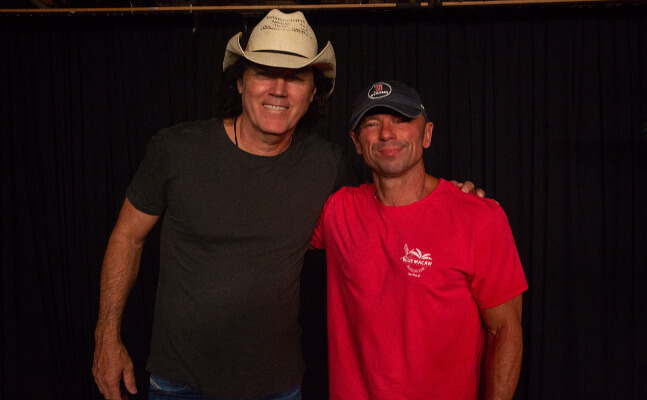 As waiters passed trays of hot chicken’n’waffles and fried green tomatoes, David Lee Murphy and Kenny Chesney were being feted for the feel-good summer anthem “Everything’s Gonna Be Alright,” written by Murphy, Chris Stevens, and Jimmy Yeary. Whether it was BMI’s Leslie Roberts telling the assembled crowd how the lyric and the melody “and the sound of David Lee and Kenny singing, they take you back to high school, listening to two of your best friends sing and you don’t have a care in the world,” to Sony/ATV’s Troy Tomlinson confessing he asked Kenny what he was thinking when he called to say he was considering making what became No Zip Code, and being told, “because it’s the right f’ing thing to do,” the mood was joyous and light. For an indie label, a GRAMMY-nominated songwriter who’s written seminal hits for Jason Aldean, Blake Shelton, Thompson Square, Jake Owen, and Chesney, “Everything’s Gonna Be Alright” is just the beginning. They’ve got No Zip Code, a brand-new single in “I Won’t Be Sorry” and a whole lot more great music to go.